Let us start from the beginning. Seven years ago guitarist & bassist Markus Berger, who sadly passed away early this year (R.I.P. metal brother), teamed up with his longtime friend Markus Maichler on keyboards & piano, and created prog rock & metal act Dante after playing around with some of their own musical ideas in Berger’s own studio. Two positions were still left open, so they recruited vocalist Alexander Góhs (former frontman of Berger’s previous act “Twelve”) and drum machine Christian Eichlinger to complete their crew of musicians in control of this new German prog machinery. With some fine tuning of this machine based in Berger’s recording studio, they unleashed after two years their self-produced & self-financed debut “The Inner Circle”, which was applauded and met with great respect by many metal reviewers all around our globe. Same year bassist Michael Neumeier was hooked up, and took over the bass duties of Berger, and then became a permanent member of the band. Two years later in 2010, and the sophomore album “Saturnine” saw the light of the day, released by their new label ProgRock Records, continuing the success of the band. The following year bassist Michael decided to leave Dante, and they welcomed guitarist Markus A. Bader on board their prog metal flagship instead, and Berger returned to his old role as the bass player of the troop. My great adventure through the challenging musical landscapes created by Dante has sudden come to an unexpected end after counting more than one hour of total playing time. It was a continuous bombardment of my ears with strange & complex rhythms, tempo changes, awkward time signatures, mellow passages, gorgeous 70’s styled keyboard sounds blended with heavy and crunchy guitar riffs and solos, all complemented with symphonic influences to make it an interesting and pleasant listening experience. Maybe they borrow some ideas from legendary prog titans Fates Warning and Dream Theater, but arresting them for being a copycat would not hold up in court. It’s a roller coast ride through the whole album, and each of the seven songs is molding our ear wax as different as night and day. The opener “Birds of Passage” is a soft and mellow introduction, whereas the following song “The Lone And Level Sands” is exploring the more heavier and aggressive sound of Dante. “Beautifully Broken” is walking on a total different path, and is the only ballad song included. It’s a melancholy song told with beautifully and mesmerizing piano melodies and by the voice of Alex singing with great control and emotion in his preferable low to mid range registers. Fourth song, and the star of the show is “The day That Bled” a tune delivering myriads of shades and musical colours for you prog enthusiasts to delve into. Next on the list is the song “Shores of Time” following in the footsteps of its predecessors, followed up by the softer and slower song “Allan”. The title song “November Red” is the final destination of our journey, and closing of with a big bang. It’s the epic of the album, delivering some of the most heavy and aggressive moments, broken up by mellow passages. Production-wise, this is wrapped into a high quality package, and the musicianship is first class, but it still suffers in the vocal department. Vocalist Alexander Góhs would not be my first choice in the front seat of a traditional prog band, because of his lacking range and dynamics in his vocal performance. He knows his weaknesses and strengths, and mostly stays in his comfort zone the low to mid range registers, and then actually becomes quite enjoyable. His voice definitely takes time to get used to, but is one of the band’s signature sounds for better and worse. So let’s cut to the chase. 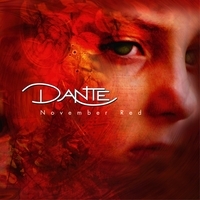 The latest creation “November Red” delivered by Dante is not a quantum leap forward for progressive music, but they still have a huge and very unique distinct sound of their own. It’s a moody and melodic progressive music experience, and if your ears find comfort in listening to the likes of Fates Warning and Dream Theater, then don’t let this release slip through your fingers. “November Red” takes time to grow on you, but stay open-minded, and it will bury itself deeper and deeper under your skin. It’s definitely one of those progressive bands I’ll keep my eyes and ears locked on too for many years to come.